It was more difficult that I had anticipated. The fibers were much shorter than the wool I'm used to so I disliked spinning it for the same reason I dislike spinning cotton. Although I must admit that the finished product is much more satisfying since the dog's owner (and possibly also the dog itself) will enjoy the finished product. I wonder if the dogs will recognize themselves when they see/smell it. I accidentally left the husky yarn ball where they cats could get it one night and they did quite a number on it. They do the same thing to other yarn when it's left out so I doubt this was a dog vs. cat-related act of violence. The yarns are unbelievably scratchy so perhaps it was "fighting back" with them. The other fur samples were too short to spin, so I will do some experiments with making them into felt and see how that goes. 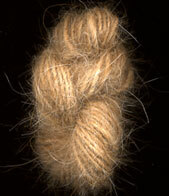 Today I start my experiments in spinning pet fur, courtesy of my friend Angela who is a groomer. 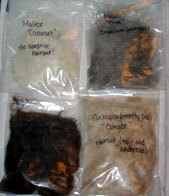 Yesterday I received my first batch of fur samples and I can't wait to get started. I'm starting with Merlin the Golden Retriever, and will soon move on to a Husky, Cockapoo, Maltese, and long haired Dachshund. 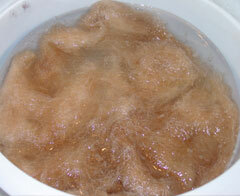 I decided to wash the Golden Retriever fur before carding it even though it didn't smell bad. 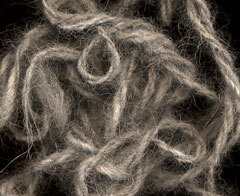 All the wool-prep instructions say you must wash your fiber prior to spinning, but sheep are much filthier than house pets. Maybe I'll spin one of the others unwashed just to see how it comes out. I am glad to have found an online instructional video on carding because none of the books explain it in a way that translates easily to real life. After I become comfortable in this area, I have a couple of ounces of my cat Hedwig's fur that I'm saving up for something special. I haven't decided what.